Become part of our high quality photo galleries! Do you want to come out to a venue and get caught and make it to the front page? If yes, you'll want to continue reading on, because here, we will show you step-by-step how you can appear in our photo galleries and possibly make it to the front pages right in your favorite venue! Paparazzi is a word to describe at least one person that takes pictures of things they find interesting at any of the venues they visit, but sometimes without verifying that the thing can be photographed. Unlike Paparazzi, we do our best to avoid taking pictures that upset or scare people, and if we do by accident, we will remove them, and you may also report them online as well. We recommend this, because if you start naturally dancing at a venue we are at, we could take lots of pictures, however, at your request, we can avoid taking pictures that have you in them. Remember, We have been doing photography since the year 2000. Example identification cards that are acceptable include a valid passport from any country, and a government-issued ontario drivers license with photo. If you want to make the front page, at least be dressed to some degree. Some venues require that you comply with a certain dress code in order to be guaranteed entry. This dress code may include wearing pants to the venue regardless of the weather outside. Technology may be advancing, but you cannot expect a venue to be free, nor to be equipped to accept forms of payment other than cash. It all depends on the venue that you are going to. Unless the venue is generally expensive, you could often get away with entering by yourself for less than $20. You may also want to carry small additional cash in case you are interested in any item the venue sells. Check with the venue to confirm their acceptable methods of payment for all the products and services you need before thinking of only walking in only with a money card (such as a bank or credit card) and no cash. We saw people of different ages dress up in costumes, dance, wear different kinds of hats, AND we even saw Toronto Mayor Rob Ford! We saw it all! or did we? Perhaps you can be the next big thing! Well, you don't have to get to those extremes, but at least make some sort of effort to have a good appearance for the camera regardless of your age. When we see you and take a picture of you (and your friends if applicable), we will give you a card that mentions a venue we go to and/or our website so that you can appear in even more pictures taken by us in the future. Now remember, We dress in uniform. Our photographers wear a black shirt with a yellow happy face logo on the front and the word "Photographer" on the back. Once we are finished taking pictures for the night, we will begin editing them and removing those that do not fit our picture display criteria. After that, we will present the remaining ones that passed our checks. Generally the processing time is anywhere between three and 24 hours, depending on how many venues we cover that night. Confirm details with the venue before you arrive in order to ensure a hassle-free experience. Such details include product pricing, entry fees, special entry requirements such as age and dress code, special house rules, hours, etc. 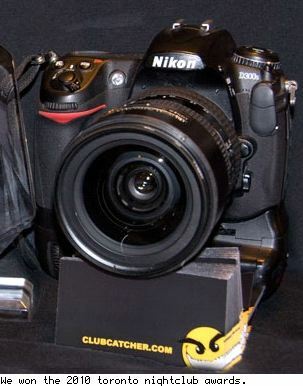 We add a flash unit to it to provide the best in nightclub photography.